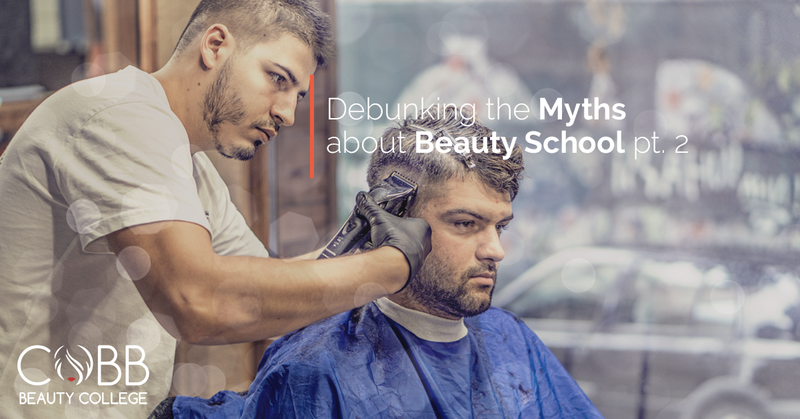 There are many myths out there about beauty school, but you shouldn’t let them keep you from attending. #4. All cosmetology schools are the same. Many prospective cosmetology students are on a budget and want to get the best training program for the price. But not all beauty colleges are made equal, and when your future is on the line, you shouldn’t settle for less. One of the best ways to tell if the school you’re looking at is worth your time is to ensure that they are accredited. It’s also a good idea to find out about the school’s placement rate, completion rate and licensure exam pass rate. Passing the licensing exam can be difficult, and you want to ensure that you’ve picked a school that will help you get through it. #5. You won’t be able to get any financial aid for beauty school. This happens to be one of the most common misconceptions about beauty school, but you’ll be glad to know that it’s simply not true. There are many different financial aid options at your disposal for cosmetology school. If you’re looking to attend Cobb Beauty College, you’ll have grants and loans available to you. We also encourage every student to fill out a FAFSA so that they can cash in on the financial aid they are eligible for. #6. Beauty school is restrictively difficult. In our last blog, we debunked the common myth that beauty school is an easier, softer alternative to getting a four-year degree, but many people also avoid beauty school because they feel that it will be too difficult. The truth is that, while yes, beauty school can be difficult, as long as you have the right instructors, a dedication to success and are willing to put in the time and effort, you’ll be able to get through school and your licensing exam. Here at Cobb Beauty College in Kennesaw, we are proud to say that our school has a 100 percent licensure exam pass rate, and we focus on hiring the very best instructors. Now that you know the truth about common beauty school myths, you’ll have the information you need to make the right decision about your future. If going to beauty school is the right route for you, visit us online at Cobb Beauty College today to learn more about the cosmetology programs we have to offer. As always, if you have any questions or concerns about our programs, financial aid, our accreditation or anything else, we’re always happy to help. Give us a call today!